It's Almost Supernatural: "Our Country is Going Down"
"Our Country is Going Down"
“Our country is going down”. These are the words of Sunday Times photographer Simphiwe Nkwali whose image of a foreign man being burned alive has been included into a harrowing photo journal entitled Flames of Hate. Our country is at a crisis point and still the army has not been brought in to calm the violence. 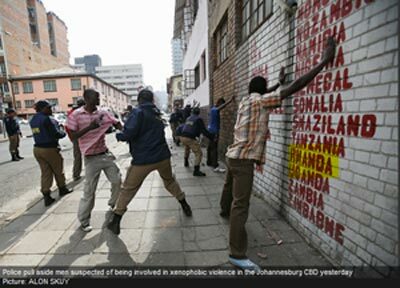 The police force has been outgunned in many of the informal settlements where the xenophobic attacks have taken place. Over 20 people have been brutally killed in a week of xenophobic attacks, where not only foreign Africans, but local South Africans in minority tribes, have been targeted. These scenes remind me of Rwanda 1994. Not to the scale, and of course this violence is not sanctioned by the state, but as far as intent of the aggressors is concerned, its goringly close. Simphiwe Nkwali is calling on President Mbeki to declare a state of emergency and to deal with the thugs with the full force of the law. I can imagine the President's response..."Crisis? What crisis?" When you combine that attitude with the ANC President Jacob Zuma's irresponsible chanting of "umShini wami", (which means, "bring me my machine gun") you begin to understand why so many South African's are bemoaning a lack of leadership in this country. Hopefully both presidents will stand up and prove us wrong. A reminder to our readers that the SA Jewish Board of Deputies is calling for donations to be made via the following collection points. An ironic photo. Emphasis on Rwanda is mine. "its goringly close" - a pun that could launch a thousand chuckles. While you're being libberal (or is it conservative?) with your highlighter - there are a few others on the list that need a little more colour. On a serious note though, does the military have jurisidiction in such situations? Surely they can't simply be deployed in urban and civilian areas? Well if they declared a state of emergency, I don’t see why not. Unfortunately, with mob violence and mob mentality, there is nothing stopping a riot from spreading into other areas of "frustration". Pagad is a perfect example of this. This fire can easily spread from Anti-foreigner to Anti-tribal and open up the wounds of the ANC/IFP battles 15 years ago. If not extinguished, this can spread beyond nationality and tribes to include race as well. How ironic though, that the "foreigners" are accused of being criminals yet the vigilanties have murdered these criminals to justify the means. I guess you are right hard rain, but I wonder if anyone will think of apartheid when they see the guy that was necklaced? I certainly did. Look, I don't mean to be an apologetic for the government, they're at fault on many levels for what's happening but I must say that using the army and declaring a state of emergency is over the top. These are incidents of crime, deplorable, but they are not an imminent threat to the country as a whole. They are also relatively isolated, which we should be glad for. I'd say the army should only be deployed in times of insurrection or total sedition. The army is in no ways trained to police a population. Maybe to assist police at times, but let's be serious, we're talking about the SANDF here, not the IDF. I'd say at the least the police presence can be heavily boosted, they can appear ready in riot gear with shields and if the mob chaos continues a curfew on the streets can be declared. Hard Rain, I understand the perception problem, but I do think that declaring a state of emergency can be a legitimate response. The fact that this instrument of government was abused in the past does not make the instrument in and of itself wrong. There is a very big difference between defending the rule of law of a democratic country and that of a racist, non representative state. Hard Rain, the last thing i would like to see is a Musharaf styled military rule but we cannot rule out the army, even without this crisis right now. It would be beneficial for the army to take over trivial police work such as road-blocks or police presence at an event. this would allow the police to focus on hitting hard crime more effectively. Perhaps if this option was on the table, crime would decrease and the real criminals, both foreign and local, as well as these present vigilantes, will be dealt with in an appropriate manner and and most importantly within the rule of law and protecting the innocent. The fact is that the Zimbabweans are here is because they are fleeing for their lives from Mugabe's ZANU PF Nazi regime. It is the fault of the SA government for keeping Mugabe and ZANU PF in power. No South African has a right to do or say anything against the Zimbaweans if they have not tried to get the SA government to stop supporting Mugabe. I do agree with you, bringing in the army is a huge step, but if the police are failing to secure this thing soon I just wonder if it wouldnt become a neccesary evil. Although I am not sure that a state of emergency is what we need at all. The kinds of powers that it brings, like extended arresting power are not going to bring much more to this situation. Is it to much to hope for that the mere presence of a massive military infrastruce would shock people into chilling out a bit? I am absolutely against Bigben's idea. The ANC regime would use it to crack down on opposition parties in th e twonships such as the IFP, UDM and Azapo. We have all seen in zimbabwe what draconian use of state force does. What makes you think it won't be used here? Are you against the army or the state of emergency? The fact is that the army would be ineffectual in riot control if they have to hold their fire. The police are responding to huge mobs with rubber bullets. When they open fire, some of the mob members are wounded. The police would have more effect if they were to use live fire. I am totally for the police being given rights to respond with live fire when fired upon. Y would the army be ineffective? They seem to do alright in major peace keeping operation through out Africa. I am against a state of emergency. This would acclelerate and not slow down the zimbabweanization of SA. I agree Gary I dont think that a state of emergency would help anyone. I'm also against the deploymenty of the army in the townships unless the conditions demmanded by the IFP are met. Who needs Durban II when you have Reiger Park I? Following high-level discussions between the ANC and the IFP in Gauteng yesterday, both parties agreed that the xenophobic violence that is currently sweeping through the province, is prominently driven by criminal elements and not just driven by xenophobia. We want to make it clear that the leadership of BOTH parties at this meeting called on our supporters to resist from engaging in ANY acts of violence. 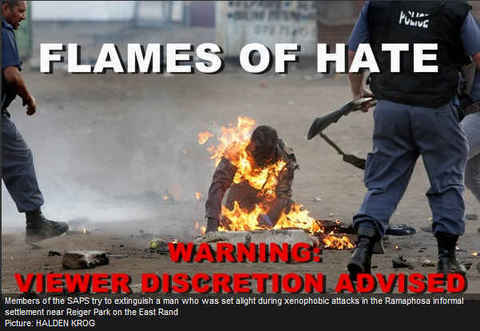 We have warned our members that should they be found to be involved in any violation of human rights or any perpetration of xenophobia and violence against foreigners, the IFP will take stringent disciplinary steps against them. We also call for the full might of the law to take its course without fear or favour. At the meeting we also urged the leadership structures of BOTH parties, down to the lowest branch levels, to address their supporters as a matter of urgency, so that we can use both parties to play a leading role in STOPPING this senseless violence. Furthermore, the IFP would like to urge NGOs and local government to assist those who have been affected by the violence by providing humanitarian assistance to the displaced. In conclusion, we are calling on the SAPS from its top leadership down to constable level to do everything in its power to protect the lives of these innocent victims. We also urge the police to use intelligence to get to the root causes of the problem. We must STOP the violence and the perpetrators must be brought to book NOW!